It’s looking more and more like 2016 was the start of TN’s American Muslim Advisory Council (AMAC) love affair with anti-Semites. 2016 was the year that anti-Semite Linda Sarsour was featured at an AMAC event. That same year Ilhan Omar and her radically progressive anti-Semite defender, Pramila Jayapal were brought into AMAC’s circle of friends. 2016, was the year Omar was elected to the Minnesota state legislature and Jayapal moved up from the Washington state legislature to the U.S. House of Representatives. This is the same year that AMAC’s Board member, Somali agitator Mohamed Shukri Hassan, welcomed Ilhan Omar and Pramila Jayapal to a home-based gathering in East Nashville. 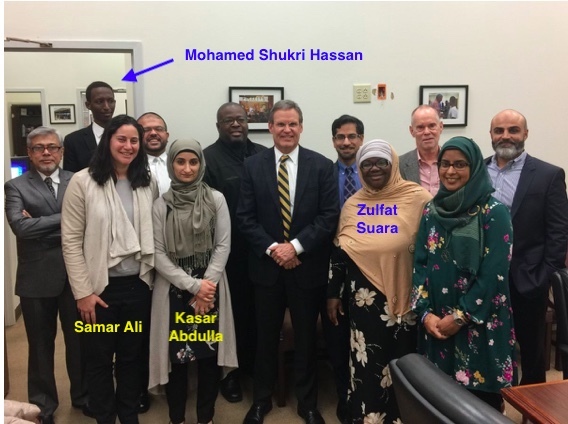 Shukri Hassan attended the January 10, 2019, meeting with Governor-elect Lee. Like Omar, Shukri Hassan got into the U.S. via the refugee resettlement program. Both of them grew up benefitting from the goodies generous Americans make available to refugees. Yet both of them are steeped in disdain for this America and American conservatives who ascribe to Judeo-Christian principles. In fact, sharia adherent Omar and Hassan hate us so much that they have devoted their lives to changing our country. Before launching her legislative career, Ilhan Omar was a board member of the Muslim Brotherhood’s CAIR-Minnesota organization. Shukri Hassan was president of the Muslim Student Association (MSA) while he was a student at TN State University. 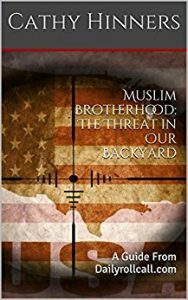 The MSA was one of the first Muslim Brotherhood organizations established in the U.S. Being an anti-Semite comes naturally to sharia and Muslim Brotherhood followers. CAIR’s connections to U.S. designated terrorist group HAMAS have been established with credible evidentiary documentation in the Holy Land Foundation terrorism prosecution. Since its founding, HAMAS has remained committed to a singular purpose – the elimination of the State of Israel and genocide for its Jews through violent jihad. A lawsuit revived in federal court last year has exposed details about the connections of the U.S. HAMAS support network and certain Islamist organizations including the Islamic Association for Palestine (IAP). It was the leaders of IAP who founded CAIR. Nihad Awad, CAIR’s national executive director has stated publicly that he supports HAMAS. Prior to forming CAIR, Awad was the president of IAP. AMAC’s Shukri Hassan arrived in Tennessee in 2006. His mother was the first to arrive in the U.S. as a refugee and was resettled in Georgia. After Shukri Hassan and his six siblings were able to join her, they all relocated to Tennessee. Shortly after finishing high school, Shukri Hassan joined TIRRC (TN Immigrant & Refugee Rights Coalition) to learn the ins and outs of being a leftist agitator and working as a “Welcoming TN Coordinator” speaking to Chambers of Commerce and Rotary clubs. At the same time, Shukri Hassan worked as an Outreach Coordinator for the Metro Public Health Department as a caseworker for the now-defunct Center for Refugees & Immigrants of Tennessee (CRIT). CRIT was originally named the Somali Community Center but changed its name after its Executive Director, Abdirizak Hassan pled guilty to federal grant fraud. The federal charge relates back to his indictment in 2001 for felony illegal banking. Prior to serving as ED of the Somali Community Center/CRIT, Hassan ran a hawala money changing business which counter-terrorism investigators was linked to a bank service linked to al-Qaeda. was started by a Kurdish refugee who was a former lobbyist for TIRRC. After she left, ACO was led by former CAIR director, Paul “Iesa” Galloway. AMAC may not call itself CAIR, but it operates same way using the same tactics. U.S. Rep. Pramila Jayapal who traveled with Ilhan Omar to the house party in East Nashville, has a special soft spot for Somalis like Omar and Shukri Hassan. Before she got into politics, first as a state Senator and then polluting the U.S. House of Representatives with her radical progressive politics, she led a leftist organization called the Hate Free Zone Campaign of Washington (state). In 2003, under her leadership, the organization stopped the deportation of Somali criminals and visa overstayers in the U.S.
FBI statistics show that the district Ilhan Omar represents in Congress, has the highest rate of terrorist recruitment in the United States. Like Omar, Jayapal is a strident and shrill opponent of President Trump and his policies about importing more refugees from terror-prone countries. Jayapal is currently the co-chair of the Congressional Progressive Caucus (CPC) which Ilhan Omar joined as soon as she was elected to the U.S. House. It was through the arm-twisting efforts of the CPC and the Black Congressional Caucus that forced Pelosi to allow the anti-semitism resolution to be highjacked away from Omar’s relentless Jew-hating speech so that she and her fellow Islamists somehow became the victims. Only 23 Republicans – none from Tennessee by the way – had the moral and political fortitude to vote against the resolution. Across the board, Tennessee Republican House members voted FOR a resolution that legitimized the myth of Islamophobia, avoided any condemnation of Ilhan Omar, and deflected from the bigger problem of anti-Semitism. Tennessee Republicans that voted FOR the resolution (because they were too scared to be called racists?) – Tim Burchett, Scott DeJarlais, Chuck Fleischmann, Mark Green, David Kustoff, Phil Roe and John Rose. Do these guys have any idea what’s really going on in their own state????? ← Previous Previous post: Tennessee Muslims Silent On Christians Demise. Next → Next post: The Myth of Islamophobia, The Truth About Those Who Invented It.